Why the Pro-Life Democratic Politician Is DisappearingPartisan polarization and an increasingly progressive party have thinned the ranks of the anti-abortion Dems. The trend continued in the midterms. Planned Parenthood Counter-Protest Drowns Out ‘Defund Planned Parenthood’ RallyThe Defund Planned Parenthood rally was outnumbered. 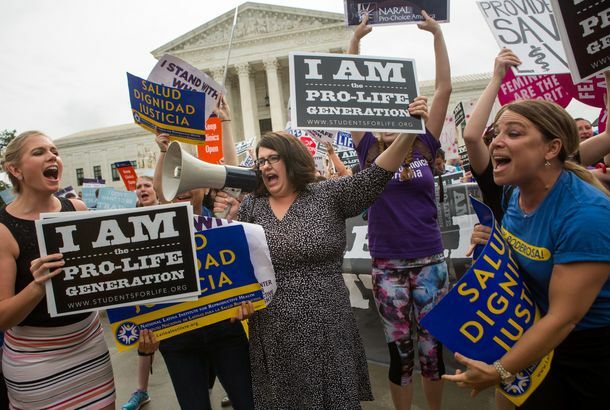 Some ‘Pro-Life’ Activists Are Rebranding As ‘Anti-Abortion’Students for Life is using a term most anti-choice activists have long shied away from. Donald Trump Is Forming an Anti-Abortion CoalitionAnd he’s recruiting longtime pro-life activists to lead it. Indiana Judge Halts Abortion Ban The Indiana law would have banned abortions sought based on the fetus’s disability or genetic anomaly. Pro-Life Ads Target Women at Abortion ClinicsThe only way to block the ads is to not bring your phone with you, or to disable GPS tracking. Abortion Rights Movement Gets Sting Video Artist to Call Its OwnLila Rose, meet Katie Stack. What Should We Say Instead of ‘Pro-Choice’?As Planned Parenthood moves away from the term, feminists offer up new options. Fifteen Women (and a Few Men) on AbortingRelief, regret, and everything in between — or nothing at all. Pro-Life Pregnancy Crisis Centers Need Our Tax Dollars Too!Preferably the ones currently going to Planned Parenthood. Charmaine Yoest to Take Down Roe v. Wade State by StateAnd she’s implicated Dr. Seuss. In Which George W. Bush Mistook His Housekeeper for His MomSometimes it’s hard to remember who put the fetus in the jar. Pastor Gets Two Years Probation for ‘Wanted’ Posters Targeting Abortion DoctorsPhilip “Flip” Benham found guilty of misdemeanor stalking and violating North Carolina’s new residential picketing law. Bush Became Pro-Life After His Mom Showed Him a Fetus in a Jar From Her MiscarriageWasp dynasties — they’re not just like us.